I would like to live in a world where anyone can go out and go about their day-to-day life without having to be cautious of where they and the type of people who might be about. However, that is not the case. I'm cautious when I'm out alone, I'm aware when I'm on public transport of the people around me, I'm aware when I'm in places that aren't well lit, and I'm aware when I get that odd gut feeling. Yet still I've had cars follow me when I've been out running, had guys not accept that I didn't want to give them my number, I've been inappropriately touched on public transport (yes, I addressed it then and then calling them out on their inappropriate behaviour) and I've even been followed in my car. I know that my level of fitness and strength is quite high however my ability to protect myself and get out of a situation is limited without specific training. This along with many other reasons is why I train in Brazilian Jiu-Jitsu at John Donehue Jiu Jitsu & MMA in Notting Hill (close to Monash University in Clayton) with Head Coach John Donehue. The John Donehue Jiu Jitsu & MMA 6 Week Self Defence Programme is not only a great introduction to martial arts but will equip you with some effective self-defence techniques. This self-defence programme is based on Brazilian Jiu-Jitsu, which is a combat form based on weaponless fighting, creating techniques designed to put you in control, no matter your size or strength. 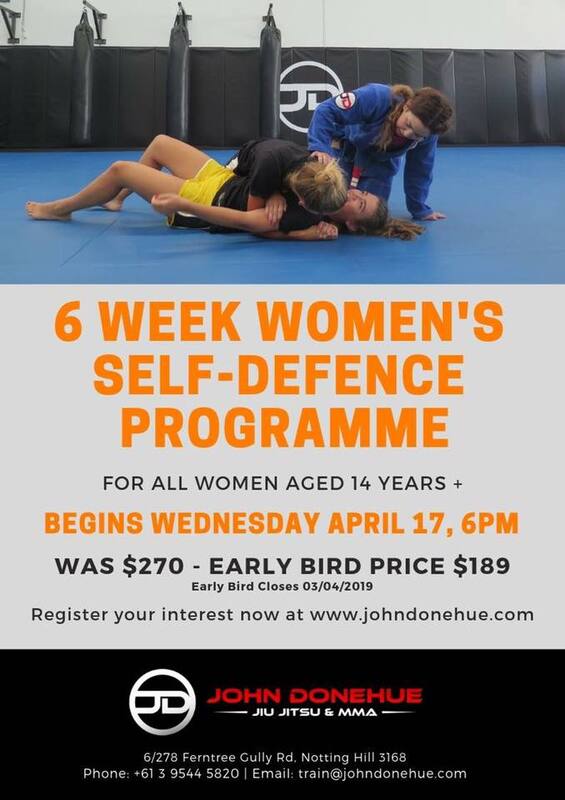 The weekly one-hour self-defence programme is exclusively designed for women 14 years and older and kicks off on Wednesday the 17th of April. John Donehue Jiu Jitsu & MMA’s qualified coaches will teach you easy to learn and highly effective self-defence techniques in an enjoyable, non-threatening environment. I personally encourage the women of Melbourne, in particular, those who like myself train in the outdoors to sign up to this programme and equip themselves with the skills that might just one day make a big difference. I previously worked at John Donehue Jiu Jitsu & MMA and I'm currently a member of the gym training in Brazilian Jiu-Jitsu.